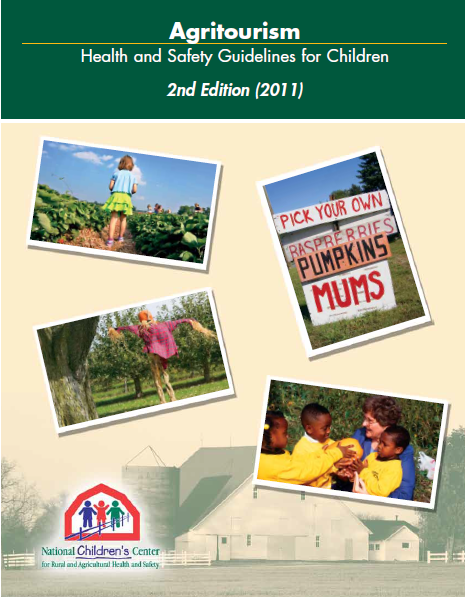 "Recommendations in this guideline document were developed to give farm owners the information necessary to reduce the risk of illness and injury to children visiting their farm, while at the same time providing an enjoyable and educational experience. They were written specifically for owners of farms who may operate an agritourism operation in addition to regular farming activities, as well as for farmers who may host a one-time event such as a tour for schools and other youth groups. The guidelines are also appropriate for larger, long-term agritourism attractions. Agritourism can cover a wide range of scenarios including, but not limited to, corn mazes, “pick your own” fruit and vegetable crops, educational tours for school children, farm-based festivals and country markets and stores. Regardless of the reason for children being on the farm it is the responsibility of the farm owner to control hazards that may risk the health and safety of children and other guests. The health and safety guidelines in this publication pertain specifically to children. These guidelines are written with the assumption that supervising adults are responsible for the health and safety of children. In 2006 there were more than 23,000 injuries to children who lived, worked or visited a farm operation. More than 100 children die of agricultural injuries on U.S. farms and ranches annually. By implementing these guidelines, farm owners can reduce the safety and health hazards that harm thousands of children every year. It is the responsibility of farm owners to identify the health and safety hazards on the farm and apply the recommendations to their specific situations. Each farm is different, with its own unique hazards, and therefore there may be hazards present on farms that are not covered in this document. It is recommended that farm owners take the key concepts and recommendations from this document and evaluate health and safety hazards on their farm." I am a Professor at the University of Wisconsin - Madison in the Department of Biological System Engineering (College of Ag & Life Sciences). My expertise is in agricultural health, safety, and digital technology in ag and food systems. I am interested in innovation in agriculture - especially when it has the potential to reduce human or economic risk and increase profitability. My colleagues and I work within the Cooperative Extension network to help farmers, workers, farm families, and communities with technical issues, and, to better understand the impacts of agricultural life on their well-being.